Agricultural land is continuously becoming less available for cultivation due to increasing population and unfavourable environmental conditions including climate changes. Salinity, worldwide, is one of the biggest problems for agriculture leading to significant yield losses especially in dry lands. The best solution for proper use of these lands would be by using salt-tolerant crops or crops with phytoremediation properties. Since the phytoremediation potential of salt-tolerant crops is negligible, thus, cultivation of halophytes serves as replacement for crop plants to desalinize the saline or alkaline areas. Halophytes constitute most of natural flora of the saline soils, with maximum survival and productivity. 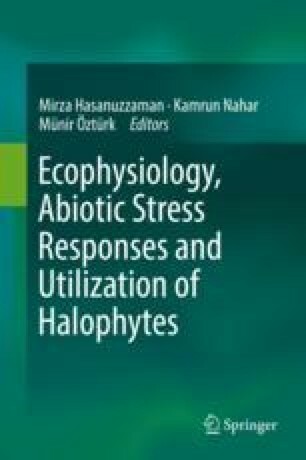 Therefore, there is an urgent need to explore halophytes, which will give an insight into the mechanisms adopted by halophytes for survival and productivity on saline areas. Also, saline agriculture can be made feasible by exploring halophytic growth attributes. In addition, halophytes can serve as alternate crops in waste lands while making them suitable for traditional crops over a period of time. Thus, the importance of halophytes in growing over saline areas not only brings out ecological recovery of saline soils but also produces huge biomass as a biofuel for renewable energy source and ultimately leading of CO2 sequestration. Hence, the phytoremediation property of halophytes can be tremendously cashed in a more economic way with minimum inputs. In coastal areas, mangroves support the living system w.r.t. agriculture, aquaculture and wild life and also stabilize the coastal saline lands. Mangroves are also providing commercial products in form of wood with multi-uses in coastal areas. In the present review, a brief compilation of the potential and special adaptive biology of halophytic plants under salinity stress is done with the remediation mechanism of these hyperaccumulators plants.